The 22″ Lightweight Transport Chair has a lightweight aluminum frame and padded upholstery. It is foldable and has padded, detachable/reversible desk arms for added convenience. 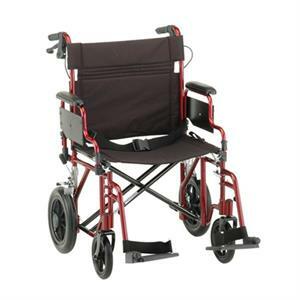 This transport chair has locking rear wheels and includes hand brakes for added safety and control. It has a weight capacity of 400 lb.